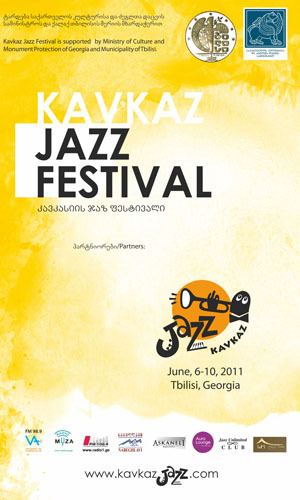 The 2011 Kavkaz Jazz festival will be conducted from June 6 to June 9 in Tbilisi, Georgia with the support of the Ministry of Culture and Monument Protection of Georgia at Kote Marjanishvili theatre. The festival will be opened by the Tbilisi Big Band and continued by bands and musicians from Georgia, Armenia and Azerbaijan. Headline acts of the event include Tbilisi Big Band Georgia, Ulvia Rakhimova (Azerbaijan), The Crossroad Band (Armenia) and Artak Nersesyan (Armenia) Dini Virsaladze Trio (Georgia). 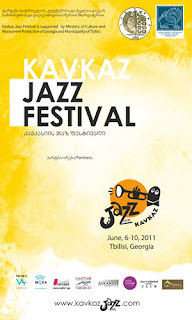 The Kavkaz Jazz festival is non-commercial festival, which is aimed at the popularization of Jazz music in the South Caucasus region. It will also provide an intercultural dialog among participating bands and musicians finding jazz as a symbol of peace, tolerance and freedom. Simultaneously within the framework of the festival workshops, discussions, and master classes for younger musicians will also be conducted. "We, Caucasians are esthetic people. Our culture is oldest and significant one in the world history. It is enough to mention Mtkvar-Arakisi culture, which was created in IV-III thousands before Christ - at dawn of civilizations. This is really a special and specific region, a boundary of civilizations. We always were characterized with tolerance towards each other and with political, spiritual and cultural tolerance. This is proved by the fact that in Tbilisi, beside each other there are built Orthodox, Armenian, Gregorian churches, Synagogue and Moslem Mosque. Today, we, musicians shall meet once again in order to strengthen our traditions and relations. Jazz is the best means for this, as it is the symbol of tolerance, unity, freedom, peace and friendship. It is a mediator between representatives of different nations and religions of modern civilization."